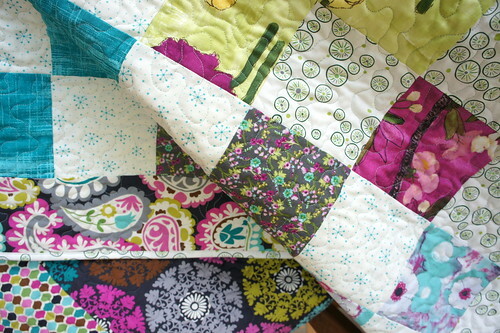 Back in the Spring, Laura Gunn sent me some fat quarters from her latest line for Michael Miller fabrics, Vignette. Those fabrics have been sitting in my sewing room, mocking me…telling me to get a move on and DO something with them. So I finally did. I decided on a simple four patch quilt from 5″ squares to show off larger chunks of the fabric, but really spread the color out. This is just one colorway from Laura’s line and I love all the fuchsias, aquas and greens. I pulled some low volume fabrics with the same colors in them from my stash to add a bit of contrast to the saturated prints. I finished the four patch and decided that it needed a little extra pop. So I went digging into my stash again (I LOVE using fabric from my stash! It makes me feel very industrious). I found the PERFECT match to Laura’s line with a few coordinates of some prints that I picked up at Hobby Lobby years ago! I used all three fabrics: the paisley as a border around the squares on the front, and the two other prints for a pretty pieced back. Really. They couldn’t match more perfectly. They look like they were meant to be together. And I love how I could combine Laura’s hand painted designs with something more graphic and geometric with the coordinates I added. 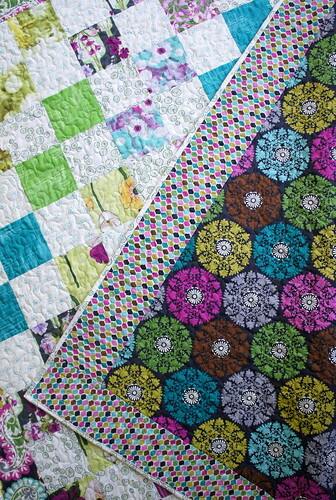 Those fabrics had been waiting in my stash JUST for this quilt. 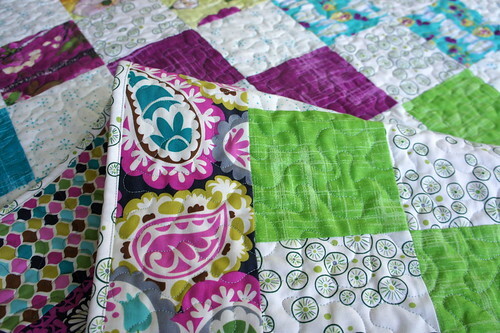 I bound the quilt with what I had left of the low volume prints I used (yay! 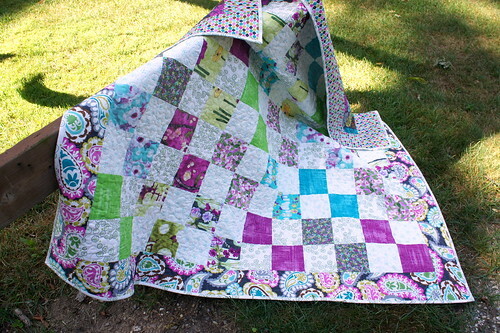 so SIX fabrics from my stash were used up with this quilt.) My machine and I were having some differences of opinions when I went to free motion quilt this. So we took a break from each other and did much better the next day when we could both relax and fiddle more. I took another attempt at machine sewing the binding…and I’m fairly happy with it. I’m certainly learning to find some middle ground for when I should hand bind and when I should machine bind. And so I finished it and took it immediately off to its brand new owner. She’s a whole twelve days old, so she DEFINITELY needed her own quilt. It will be a while before she grows into it (it’s about 50″ x 60″) but she is already sleeping on it like a pro. 😉 She’s a third baby in her family and some times those third ones get left out. But she’s far too pretty to be left out…so she needed that quilt just for her. Though I hear her siblings have already been enjoying it for her. 😉 As siblings will do. First off I want to thank Angela and Shabby Fabrics for the giveaway. I won! I then sent a note to Shabby Fabrics, first thanking them for the giveaway, but more importantly, thanking them for being a sponsor of one of my favorite blogs. I encourage all readers of this blog–that whenever you may a purchase at an online shop that is a sponsor–mention it in the "comments" section of the order form. And, of course, try to buy from those online shops that do sponsor blogs. I think it's important to let sponsors know they are appreciated and to continue to support bloggers. We blog readers are a big group–let's make our voice heard. And, BTW, the quilt is beautiful. It could also be a 9-patch, couldn't it? What a gorgeous wee girl! You've made a beautiful job of the quilt – shows that a simple four-patch can be so effective when the fabrics chosen work so well together. Great work! Love this sweet simple quilt! And so glad you gave that third child something special all her own! I agree that those fabrics work perfectly together. Hobby Lobby has really pretty fabric, and I'm glad to have one five minutes away if I need something in a pinch. 🙂 Even better in your case to bash that stash! She's a keeper, the quilt and the baby! I love these fabrics and drool over them! Hawthorne Threads has all of them plus solids from Laura Gunn. 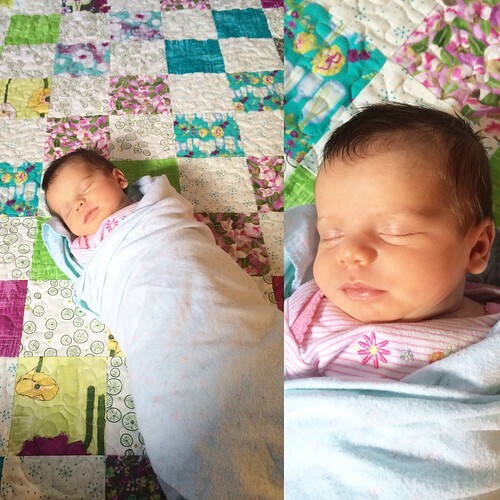 It's a great quilt and an adorable baby. Thank you for sharing. It's the first time I've seen her fabrics made up! 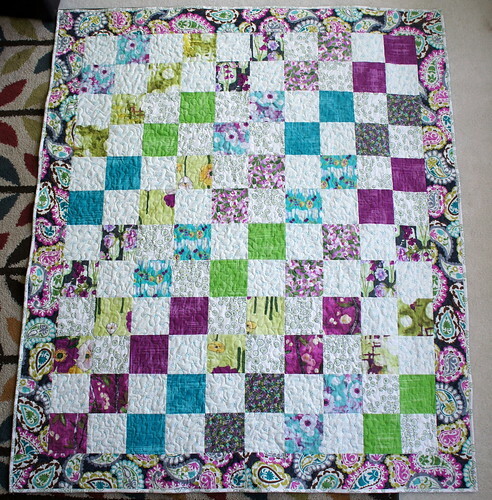 Pretty quilt for a precious baby. Oooh, so pretty! 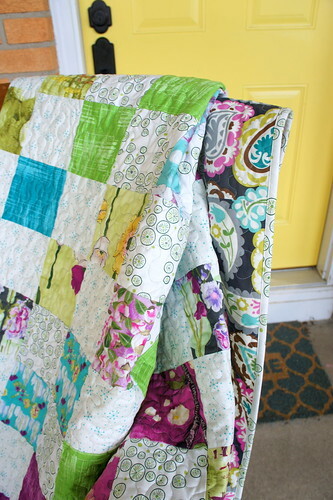 I think I love ALL of Laura Gunn's fabrics! Sweet little babe!